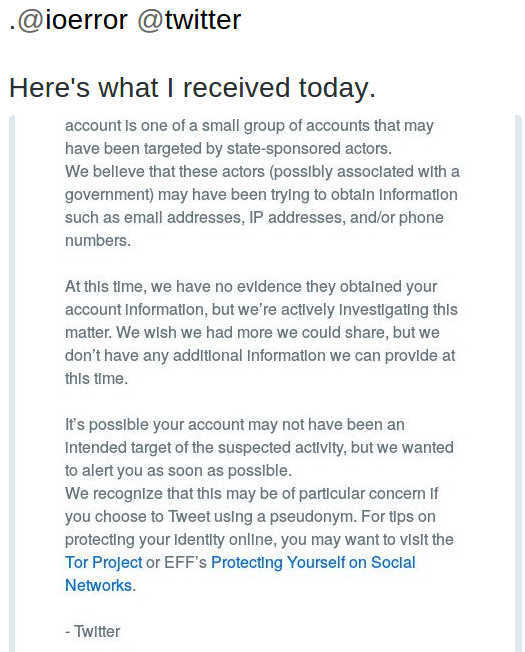 Reuters and many tech websites are reporting this morning that Twitter has been warning some of its users of a possible hack. This is unprecedented for the social media site, which has never issued such an alert before. A screen shot of a posting on Twitter of a portion of the notice the social media company has been sending to some of it’s account holders. There is no indication what “government” Twitter suspects is connected with the hack, but online news sources are speculating the usual suspects, China and North Korea. PCWorld reports that many of the account holders receiving the Twitter notices are “privacy advocates and security researchers, some of whom tweet under pseudonyms.” Reuters is also reporting that Google and Facebook have also started warning users of possible state-sponsored attacks, but offers no details. Although some sources are attempting to tie the hack to the breach of Sony’s computers late last year, there is no indication that this incident is connected or that it is as invasive. Help keep FOSS Force strong. If you like this article, become a subscriber. It’s sad to see huge corporate hacks and data breaches become daily news. The one step that would eliminate 95% of the problem is the one step the companies actively resist taking: Stop collecting all the damn data in the first place. If you don’t have it, it can’t be compromised. Most of us who work in IT know exactly how lousy almost all corporate security actually is. Companies are too big and bureaucratic to ever be able to get it right. Web based accounts should move to an asymmetric key based authentication mechanism, where no one holds your private keys but you. That way there are no passwords to steal. Remove two factor authentication and biometrics because those are just red herrings, likely to lead to more stolen data than they ever prevent. Beyond this, companies simply need to stop collecting so much data on their customers. Have customer data encrypted using only the key the customer holds. Now you can retrieve it, but only by actively asking the customer to decrypt it for you. Your local DB is stolen? No problem, every record is uniquely encrypted using keys you don’t hold. It alos gives the customer control over when that information gets used. If you get caught in a data breach holding unencrypted information on customers, you should be held legally liable for everything done with that stolen information.